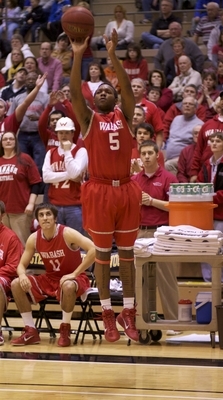 Aaron Zinnerman nails one of his four 3-point baskets in the Little Giants' 69-68 overtime win at Wooster. The Scots were unbeaten through their first 20 games and ranked number one in the nation heading into the game. Photos by Tom Runge ’71.